I owe my interest in textiles to my Gran who taught me to knit and crochet when I was just a wean, but if I told you that my current career as a designer began with being hit by a golf ball you’d be forgiven for wondering how the two are linked! Well, the golf ball caused a fractured skull which in turn revealed a brain tumour. A long (and boring!) spell off work recuperating from surgery gave me plenty of time to indulge my enthusiasm for textiles and resulted in my first book, Hand Dyed Yarn Craft Projects. The book release coincided with an explosion of interest in knitting, crochet, upcycling and making. Suddenly I found myself with the perfect opportunity to swap my sharp-suited, stilletto’d career as a tax specialist for my lifelong passion, textiles. Since then, I’ve designed for many major crafting magazines including Simply Knitting, Knit Today, Knit now, Inside Crochet, Knitting and Let’s Knit. I’ve designed for Artesano yarns and spent over four years as the “How-to” technical feature writer for Simply Knitting. 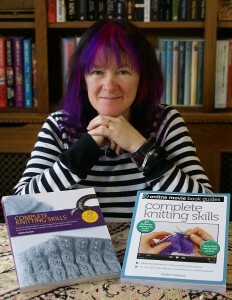 I am currently the “How-to” writer and “agony aunt” for Knit Now magazine. Three books and many designs later I now teach textiles to students of all ages and from all backgrounds. I work with community groups and organisations, schools and guilds. I also run workshops at shops, shows and events. My personal experience of serious illness and a resulting long term disability mean that I’ve experienced first hand how creative arts can enhance wellbeing and bring therapeutic benefits in difficult times. Creating was my way of coping with some tough times – it helped (and continues to help) me work through the challenges of an “unseen” disability. This experience has inspired my latest venture, “Making Futures”, a social enterprise designed to help people like me make the most of their talents in an environment that doesn’t always offer the flexibility and opportunities that allow us to reach our full potential. Running my own business for the last 10 years has taught me many things about what does (and doesn’t!) make a successful enterprise. I am therefore very fortunate to be able to pass on some of the lessons I’ve learned to others looking to follow a similar path through mentoring. Mentoring is my way of paying forward some of the support I’ve had along the way. Research, exhibitions, talks and an exciting new social enterprise venture are all projects in progress so watch this space! Above all, I love to share my love for textiles and making with others whenever and wherever the opportunity arises!